Cotec Real Estate Development and Investment Joint Stock Company (CotecLand) recently held a ceremony to announce the Blue Sapphire Resort Project in Vung Tau City. The project combines a five-star resort and sea tourism activities. Total invested capital for the project is around VND 1,500 billion (USD 80 million). This project is implemented with the participation of CotecLand (a Cotec Group member), Archipel Company (a 100% foreign capital architectural company) and constructed by the main contractor of Coteccons company. In addition, the project is also involved the cooperation of the Company Savill – exclusive distributor, Swiss-bell company as project management, Joint Stock Commercial Bank of Vietnam Asia – the financing sponsor. 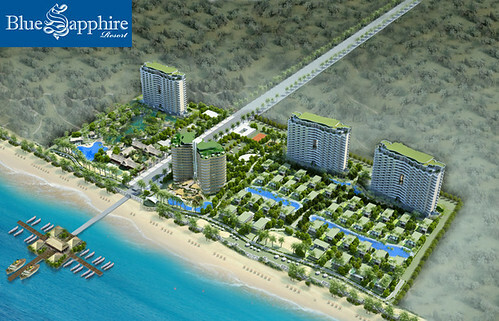 Blue Sapphire Resort is built in Ward 10, Vung Tau city oriented to become the 5 star international standard beach resort with 450m long private beach in one of the most beautiful areas in Vung Tau city. By design, this project is built on total land area of 76,905.3 m2, including building area is 18,310 m2 with two main functions of the service system for international 5 star resort and the systems for relaxation facilities. This is expected that there will be 352 luxury apartments, 28 bungalow-type rooms and total rooms of entire resort is 1262. Also at the ceremony, CotecLand said the company is planning to issue 10 million shares listed on the HCM City Stock Exchange in late July 2010. Source: Ba Ria Vung Tau Newspaper.